Turkey's capital Ankara was hit Saturday by a sudden flood, which was caused by heavy rainfall in the central Anatolian province. 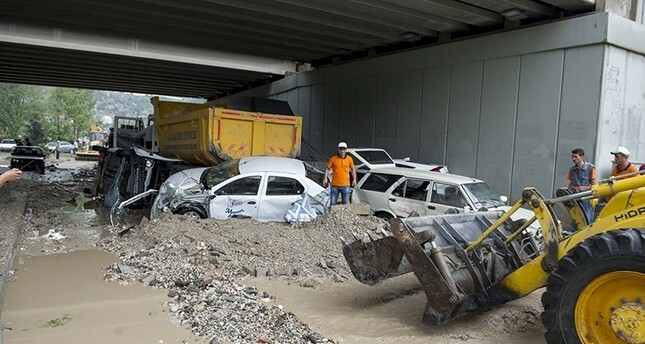 The flood dragged dozens of vehicles from the streets in Ankara's Mamak district. Videos showing a man desperately sitting on top of his car, while the flood washed away several vehicles in Mamak's Boğaziçi neighborhood were proof of the unexpected natural disaster. The man was reportedly later rescued and only slightly injured. Dozens of homes and offices on the Neşet Ertaş Street in Mamak were also flooded, while residents sought shelter on top floors. Ankara Mayor Mustafa Tuna said in a statement that six people were slightly injured, adding that none of them were in critical condition. Tuna also underlined that only Mamak was affected by the flood, saying that Ankara's remaining districts were not under risk. Municipal workers rushed to the scene to initiate clean-up activities.